The plot: The cartoon “feature” series tells the story of a young boy named “Jimmy” who is the son of astronaut, “Commander Perry”. Commander Perry blasted off in his Polaris-I spacecraft for the Planet Mars, and has not been heard from since. In the meantime, his assistant “Professor Nordheim” has been building an identical rescue rocket ship named the Polaris-II which he plans to use to search for the commander. Unbeknownst to the professor, as the final preparations are made by Nordheim to launch the rescue ship, son Jimmy stows-away in a wooden crate inside the rocket. After a brief countdown, the Polaris-II, with Professor Nordheim and his faithful female assistant and navigator “Smitty” blast off in search of Jimmy’s father. After a brief period of time, Jimmy climbs out of the crate and surprises the professor and Smitty with his presence. The trio navigate space together in search of Commander Perry, but it seems the search always comes up empty. The conclusion is explained on “The Space Explorers” website. Production: Designed as an educational programming, the “visuals” from the cartoon series were memorable as a child growing up. From their point-of-view sitting inside the rocket with the characters, children learned about the principles of space exploration and space travel by looking through the enormous star-lit front glass window. As the Polaris spaceship traveled through vast regions of space, basic and elemental aspects of science, physics and astronomy were discussed and explained such as Newton’s theory of “gravity,” Albert Einstein’s theory of “matter,” “weightlessness,” “oxygen,” and so on. The Space Explorers cartoons were produced by advertising agency executive Bill Cayton who was also “Iron Mike” Tyson’s boxing manager from 1984-1988! It was written and directed by animator Fred Ladd who also worked on such cartoons as Kimba, Astro Boy, Gigantor and many others. Various video clips are available on YouTube. Baby boomers are highly encouraged to visit the fan website at www.thespaceexplorers.com because a DVD may be released later this year. Please share this article with your Baby-boomer friends because “The Space Explorers” cartoon hasn’t been shown anywhere for over for forty-five years! This entry was posted in Cartoon, Saturday and tagged 1950, 1960 by Skooldays. Bookmark the permalink. 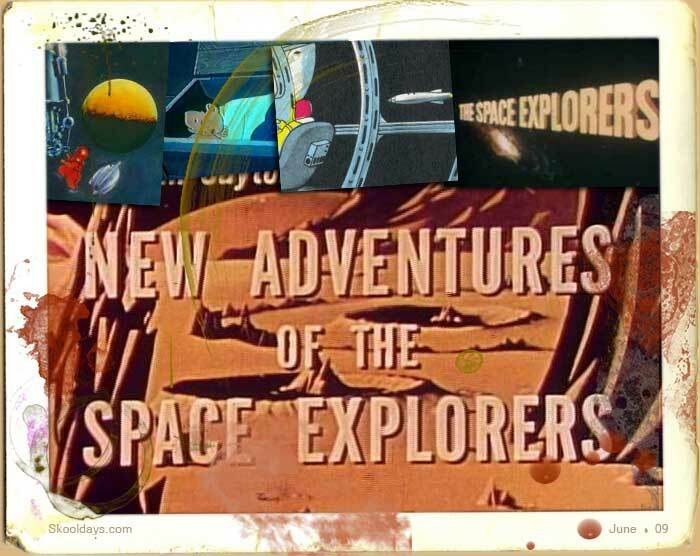 I would love a dvd of the space explores and the new adventures of the space explores. I remember watching the short 6 minute segments on the officer joe bolton funhouse show.